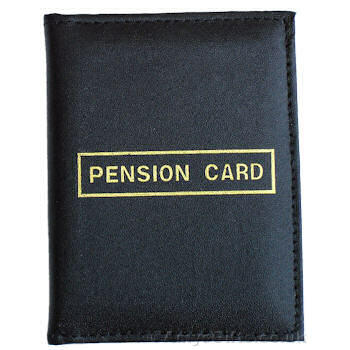 Keep your Pension Card safe and clean in this real leather cover and holder. Keep your Pension Card safe and clean in this real leather cover and holder. Store and open to display your UK Pension Card under clear plastic windows on each side. This leather holder is ideal to protect your important cards and is useful for display and carriage. Keep your Pension Card safe and clean in this real leather cover and holder. Store and open to display your UK Pension Card under clear plastic windows on each side. This leather holder is ideal to protect your important cards and is useful for display and carriage. The wallet is made from real genuine leather and is black with gold print on the front.